Glass crystals and 5-tiered gilded copper arms lend a beautiful ambiance to this lovely chandelier. The staggered stair type crystals allow for magnificent lighting effects. It requires six E 14 European Candelabra bulbs each up to 40 watts. The fixture looks great and is in working condition. Equipped with original 20th century wiring. Seller also provides 5 extra replacement Chrystal's for any unforeseen circumstances. This Bakalowits styled beauty one will go quickly so get it today! It will be shipped from Europe to buyer. All questions and shipping arrangements will be handled by our USA branch in Texas. Minor wear as expected for age. Working condition. 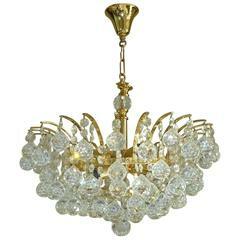 We recommend professional installation on all Vintage lighting Fixtures. Kronleuchter, Messing Kristallglas, Österreich, 1960, Stil von Bakalowits Originalzustand.